The Shamrock Run is a 4 mile course filled with fun, luck, and laughter…Maybe some beer and green beads also! The support of the community has been phenomenal and essential in the implementation of this great event. 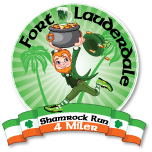 Registration Now Open for The 6th Annual Fort Lauderdale Shamrock Run! !